First Day introduction activity or to supplement describing people and yourself lessons. 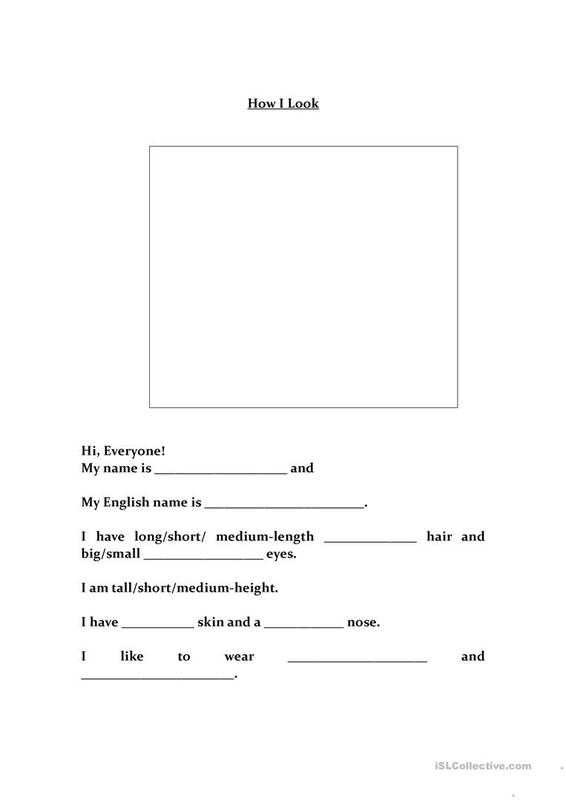 Students need to draw a picture of themselves and write a few sentences. Good for lower level classes. The present printable, downloadable handout is meant for high school students, elementary school students and adults at Beginner (pre-A1), Elementary (A1) and Pre-intermediate (A2) level. It is a useful material for teaching Adjectives in English, and is a valuable material for improving your class' Spelling, Speaking, Reading and Writing skills. It focuses on the topic and words of Body. candiep20 is from/lives in Australia and has been a member of iSLCollective since 2011-10-25 07:49:45. candiep20 last logged in on 2012-08-02 03:43:16, and has shared 1 resources on iSLCollective so far.